1 of 2 Combine flour, cocoa, sugar, espresso powder, baking powder and salt in medium-size bowl. Add milk, butter, eggs and vanilla; beat on low until blended; beat at medium-low just until smooth. 2 of 2 Coat 8-inch nonstick skillet with cooking spray. Heat over medium heat until drop of water sizzles. Pour 2 heaping tablespoons batter into skillet and rotate skillet until film of batter covers bottom. Cook until surface of crepe begins to dry, 2 to 3 minutes. Run spatula around edge to loosen. Turn over; cook until bottom is light brown, about 2 minutes. Remove crepe. Repeat with remaining batter, stacking crepes between sheets of waxed paper and covering (see Note). 1 of 2 Bring cream to boiling in heavy medium-size saucepan over medium-high heat. Remove from heat. Stir in chocolate until melted and smooth. Stir in liqueur. Pour into bowl, straining through sieve. Refrigerate 30 minutes, stirring occasionally. 2 of 2 Using whisk or electric mixer, beat chocolate mixture just until fluffy, 30 seconds. Refrigerate until chilled, about 1 hour. Then beat until thickened, about 30 seconds (do not overbeat). Fold in mini chips. Refrigerate. 1 of 1 Press berries through fine sieve into small saucepan; discard seeds. Stir in cornstarch; simmer, stirring, until thickened, 1 to 2 minutes. Refrigerate. 1 of 1 Spread about 3 tablespoons ganache along center of each crepe. Overlap sides. 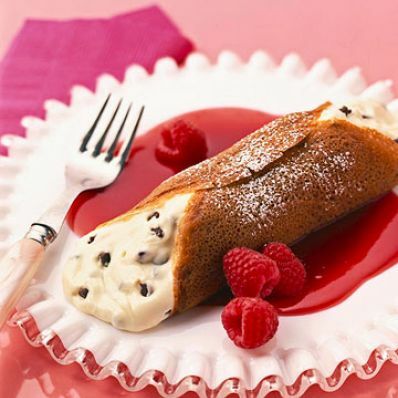 Spoon 1 tablespoon puree onto each serving plate; top with a filled crepe. 1 of 1 Crepes can be made ahead. Stack with waxed paper between them; wrap in plastic. Refrigerate several days, or freeze up to 1 month. To use, thaw unwrapped at room temperature for 3 hours.